Melissa and I (Jackie) were trying to think of some interesting ways to challenge ourselves and our fellow readers for the New Year. We've come up with an alphabet challenge that should be fairly easy to complete, if you happen to read 26 or more books per year. Then again, there are always those elusive letters, like "Z" and "U", that might really make this "challenge" come alive. And to throw an additional wrench in the plans, books starting with "A" or "The" don't count for "a" and "t"
Level 2 - Alphabet Soup. 13 books of varying letters but just like the soup, sometimes you only get so many letters in the bowl. It will still be an impressive feat! Level 3 - The Varsity Jacket. 26 books. You'll read a book starting with every single letter! Once completed, a victory lap around the track can be performed in celebration! To join in, enter your blog info below. We will be posting monthly updates where you can link your alphabet themed reviews (setting up a post where you have links to all your reviews together would be a great way to keep track too :). Remember to keep checking back until the end of the year when we'll be giving away a gift certificate and a swag pack. We're looking forward to seeing all the great books listed! A reading challenge I don't see around much is one that centers on Young Adult books. I have started to enjoy more and more YA reads, and there are so many more people out there who read nothing but YA books. With that in mind I partnered up with a great blogging buddy, Jackie from The Novel Nation and a reviewer for Book Lovers Inc. We decided to work together to get and keep this challenge going for 2012! We are very excited to do this and hope you are as well. ~~Challengers will read YA Fantasy books (fantasy is very broad now-a-days) throughout 2012. You can read as many books of the genre as you’d like, and link here to share, but to complete the challenge you must read. 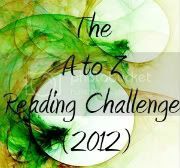 ~~Do a post announcing you are joining the YA Reading Challenge for 2012, with a link back here. ~~Add the Challenge Button to your side bar. ~~Add your blog link to the Linky below. Readers can join the challenge anytime throughout the year. You don’t need to pick your books ahead of time. I know there are amazing new books that will be coming out we aren’t even aware of yet that you might want to add to this list. Please read carefully! Yes, this is a requirement. At the end of the year you will HAVE to do a close out post, By January 10, 2012. We will have a linky set up here where you will HAVE to link that post up. This is required to be eligible for prizes. This way we can find you, and verify all required information. What you seemed to sway towards in reading material; vampires, werewolves, witches, etc. There will be a chance to win prizes at the end of the year. But you MUST follow all requirements above. Now wanting to help shine light on these amazing books and bring viewers to learn about new books we have created categories. Categories in which you can come link your reviews and if someone wants to learn about some werewolf books they can go to that page, or vampires, or witches, and so on.